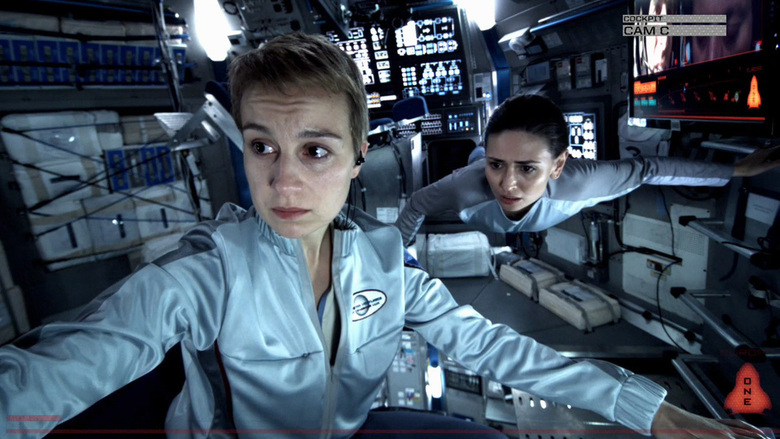 EUROPA REPORT came at a particularly experimental time for composer Bear McCreary. He’d just finished up scoring the CAPRICA TV series, the prequel to the reimagined BATTLESTAR GALACTICA series which had given McCreary so much positive attention. He was still scoring the hit series THE WAKING DEAD and had just done the TV movie BATTLESTAR GALACTICA: BLOOD AND CHROME. EUROPA REPORT gave him a new feature film opportunity and would give him the chance to explore an interesting mix of electronica and ethnic instrumentation around the same time he was developing new creative horizons for the TV/video game franchise DEFIANCE, and the series for which Bear just won his first Emmy (for best main title theme), DA VINCI’S DEMONS. Bear McCreary and his Emmy Award, won recently for his main title music for the TV series DA VINCI’S DEMONS. Bear McCreary: I was recommended to the filmmakers through my agent. It was one of the first times in my career where I’ve gotten a project and it wasn’t because of my previous science fiction experience. In fact, as I was first talking with the production team I was realizing that most of them had never seen BATTLESTAR GALACTICA and as they were talking about the concerns of creating a realistic character piece set in space, I was telling them that these were some of the challenges I faced on that show. I ended up sending them some scenes from BSG. So it was interesting, you would think they would have approached me because of that but actually the fact that I had some BSG was a complete coincidence. Q: Coming into the project, what was your initial approach – and how did the film’s mix of found footage and dramatic filming, flash backs and talking head statements, as well as its non-linear way of storytelling, affect the way the music would develop? Bear McCreary: It’s unlike anything I’ve ever done before, and it was an immense challenge. The narrative line is intentionally obscured, and in fact one of the things that was interesting is that, if you want to call this a found footage film, most found footage film do not have music because it violates the laws that dictate a found footage movie! It’s supposed to be “real.” Ostensibly, though, this film is not a random collection of images – the images have been collected by Europa Ventures in order to put a public message forward about the sacrifice of these men and women. Let’s face it, these people died, and we can understand how Europa Ventures as a corporation had to put a positive venture out there. This is sort of like corporate branding at its most delicate! So I imagined that I was a composer who had been hired to Europa Ventures and my job was to make the story compelling so that the company could avoid inevitable lawsuits and all the bad press that would come from having this mission go so disastrously wrong. 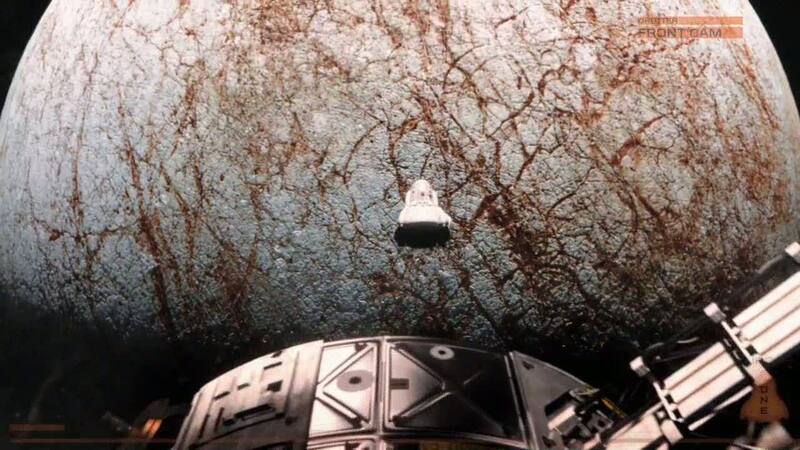 So when you have those moments when the score is shamelessly pulling on your heart strings, even though it’s a found footage movie, it makes sense to me because Europa Ventures wants to manipulate you. They want you to feel this certain way because it’s in their interest for you to feel that way. And so in that regard, even though there are times where the score is definitely doing something cinematic, it still I think lands within the rules of the found footage genre. Q: At the same time it also serves as a musical tribute to what these [fictional] men and women did out there… their sacrifice has elevated, to a great extent, their world’s scientific awareness of the universe. Bear McCreary: Absolutely. One interesting thing that I spent a lot of time talking to the filmmakers about is that right how we’re actually at the dawn of private space travel. We have SpaceX and Virgin Galactic… all these companies that are doing this. When you look at their corporate videos and their commercials, they’re always set to either real inspiring music or music with almost rock and roll sensibilities – it’s very exciting and it’s an exciting time. So I thought to myself, that’s what they’re like now, but there will come a time when lives are lost in space on a mission that is corporately funded, and when that happens – and it will happen one day – they’re going to have to put together a new kind of movie, a new kind of video that shows maturity and a sense of duty and honor, and that was what I was thinking. If this were real, what would I as someone who works for Europa Ventures, want to do to get this message there? Q: What were some of your initial discussion with the director, Sebastián Cordero, as far as what he wanted? Bear McCreary: We spent a lot of time talking about themes and character. I think that you can see the genesis of what, even though the end result of the score is very subtle, became a sound design element. In the beginning we were really talking about thematic ideas, things that could be woven through the score and help you connect with these characters. That was my entry in – I needed a theme that I could relate to. Ultimately what we talked about was that this is an uplifting movie, even though there are – I almost hesitate to even say, a sad ending. We kind of knew how it was going to end in the first five minutes, but to me the mission was a success, so I needed to find that tone, that theme, that would make us feel like these people made a sacrifice that was worth something. Once I had found that theme, and I worked very closely with Sebastián to nail that down, the rest of it was just a matter of working backwards and layering in the sound design and atonal and dissonant elements that would build up to that glorious reveal at the end. Q: The first motif that comes to mind, which we hear in the main title, is that percussive pulse, which is used throughout the score to build a great bit of tension. How did that come about? Bear McCreary: It’s interesting. I have been spending some time in the last year experimenting with synthesizer programming in a way that I never have in the past. So doing projects like BATTLESAR GALACTICA: BLOOD AND CHROME or DEFIANCE on SyFy or even DA VINCI’S DEMONS on Starz, these were sounds that I was beginning to experiment with, and I wrote EUROPA REPORT right in the middle of that time when I was really experimenting with this, and I wanted something that would be metered and cold and sound almost like an engine – an element that isn’t even musical. I must admit when I watched the film on the big screen in a good theater, it’s very hard to even tell what’s sound design and what’s music, and so that worked really beautifully because it allowed me, as the composer, to organically control when we switch from a simple kind of ominous sound into something that actually has more emotional content. Europa 1’s landing craft descends for its landing on Jupiter’s moon. The perfect example to me is when they’re swinging around Jupiter – it’s called “The Landing on Europa” –where the low end synth programming is really aggressive and it almost sounds like a helicopter blade, and above it there’s this washy, dissonant chord in the strings. When you watch the movie, you don’t even quite understand what you’re hearing, but then at the moment when Europa-1 rounds the edge of Jupiter you have this sustained note in the strings and this ostinato with a harmonic progression starts to sink in, and at that moment suddenly, to me, the hairs on my arm stand up because suddenly you’re having this visceral, emotional reaction and it’s because you’re coming out of this deep synthesizer sound-design layer, and when those chords come in, and it becomes undeniably emotional music, it’s a really exciting moment. I think, especially for the found footage genre, Sebastián and I knowingly took a bit of a risk. There are moments in that score where we are telling a cinematic story. When the celli come in with that main theme, to me it sounds luscious and cinematic. It’s a totally melodic moment, but I think the film earns it. The counter balance to that are those heavy synthesizer elements and the dissonant atonal elements. When those melodic moments come in, they are more powerful and more subtle at the same time. Q: There’s a cool technique in the climax of the film, the track “A World Other Than Our Own,” although you don’t hear it in the album track, where that same cello melody heard in the landing is reprised as Rosa re-enables communications with Earth, and the music is distorted, in the same way the A/V is distorted when the alien entity is present. That was an unusual use of dramatic music configured to react to what is happening in the movie. Bear McCreary: That was something that was a daring move on the sound design side. We needed to use certain cues… well, let me back up, and say that this is essentially a man-versus-nature film, and the antagonist in the film is the environment as well as these creatures they come across. One of the things that presented a big challenge was that you really couldn’t have these creatures banging on the door and kicking it in without breaking that precious connection to reality that the film always strives to retain. So there needed to be cues in the music, in the sound, and in the visual presentation that allowed you to know that those creatures were nearby. So while I had thematic elements that addressed them and we used the score to create that dread, the other element that was used was this stuttering static effect [on the ship’s electronic systems]. I think it was really cool that in the mix stage there are times when that stuttering even applies to the music. It’s totally an aesthetic call but it really helps drive home the idea that whenever these creatures are nearby, everything you’re hearing and seeing gets distorted. Q: What was your acoustic instrumental pallet for this score? Bear McCreary: We recorded with two orchestras. One was a full string orchestra and then there was a quartet of two violins, voila, and cello. Q: I love that you arranged your main cello melody into a beautiful piano rendition which is heard as source music under images of the crew doing their daily duties as the ship travels to Jupiter. How did you treat that, to lay a background down during these life-aboard-the-spaceship scenes but have it based on the main melody of your underscore? Bear McCreary: The idea was that it was a classical piece that they were playing and listening to. Certainly it would have been understandable had we just played Chopin’s Prelude or something (in fact you probably noticed there was another little classical music in-joke when they played The Blue Danube, which I noticed the Variety reviewed picked up on!). But I thought this was a moment where I could subtly tell you something about the crew. Those scenes before things go wrong are tricky, because the crew is acting casually. They’re not in a particularly emotionally charged environment, however at the same time this is our only chance to get to know them before things do go wrong, so I wanted to, in a very subtle way, have you connect that theme with them. Whenever we see them at their most human, their most vulnerable, we are hearing that ostinato – in that case, in the left hand of the piano, but it’s usually in the celli when it’s with the orchestra, and so when it comes back later, in a subconscious way we’ve connected it with their families and their personalities. In a very subtle way helps make them more human. Q: Then of course there’s Raya’s beautiful vocal in “Water” that adds a haunting serenity to Katya’s descending drift into the water. What emotional strings were you trying to touch there? Bear McCreary: We did a lot of experimentation and this is probably the track on the record that is the most altered from what you hear in the film – the vocals are tucked back very far because there was a point at which we decided that we were giving away too much emotionally too early in the film, but I decided to leave them in the album and mix them loud so you can hear them, because I think they are a part of the arc of the film. I did some research and wanted to find the earliest known records of human beings speculating about life on other planets, and the text actually comes from a Greek philosopher named Anaximander, he was one of the first people to really speculate about this, and when I did some research on this I was amazed to discover that there were ancient Greeks who speculated that up in the stars there were other worlds just like our own, that life evolved from the sea and crawled out. There are some really spine tingling quotes in there! I worked with Matthew Dillon, who was the consultant who did some translations into ancient Greek for CAPRICA. I wanted to have that text be sung in Greek and Latin, in the language that it was spoken in. That, to me, it just adds an extra meaning. I thought, this is the ultimate meaning for that text that, two thousand years ago someone could speculate that and that one day, we’re going to travel somewhere and find it, and I thought that’s the text that I would want to hear. Q: How have the album tracks been created – in most cases they seem to consist of several cues mixed together? Bear McCreary: The album was a bit of a challenge because the film continued to change after I had scored it. In fact, if I had put the cues in the order in which I wrote them, they would in some cases be meaningless to viewers of the film. So I put them together in a way that best follows the arc of the film but at the same time I took some liberties with the track order because I wanted to create a listening experience that had a good balance between the dissonant, atonal elements and the more melodic elements. So the piano solo is moved a little later. I did a few shifts like that so that I created what I feel is the audio companion piece to the film, if not the literal order in which the cues appeared in the film.